Garcia's Mexican Restaurant is a Mexican restaurant located in Cortland, NY. This photo was sent in by AL. He writes: "Garcia's Mexican Restaurant in Cortland NY is a small family owned business that serves the most authentic dishes. They occupy a building that was once a premier steak house. You know the kind from back in the 60's and 70's, with heavy dark wood paneling and open beams and rustic fireplace. The decor is not exactly Mexican themed but we're glad they are doing well in this long vacant building. I find the urinals here truly unique. The fixtures along with the water pipes create something close to art. 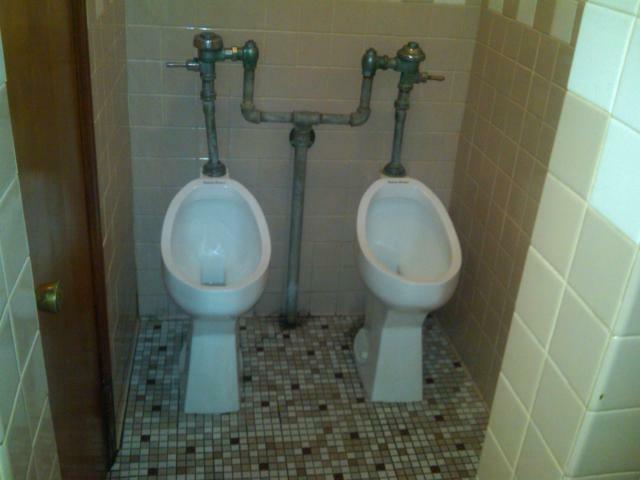 It's weird also how the pipes bring the urinals closer together but the people standing in front of them normally wouldn't stand that close together."